Buttermilk pie is a southern favorite, and I love the not-too-sweet flavor and custard texture. 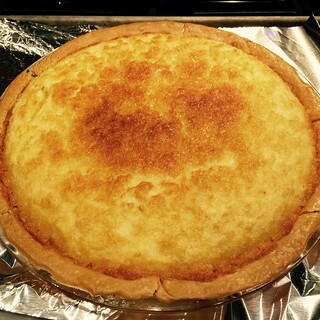 It’s similar to chess pie, but chess pie uses cornmeal instead of flour. Beat eggs until frothy; add butter, sugar and flour. Continue mixing until smooth. Stir in buttermilk, vanilla, lemon juice and nutmeg. Personally, I don’t care for nutmeg, so I leave it out. Bake about an hour, or until a knife in the center comes out clean. For some ovens, that could be as soon as 40 minutes, but it’s always a whole hour for me.